A federal judge ruled Gov. 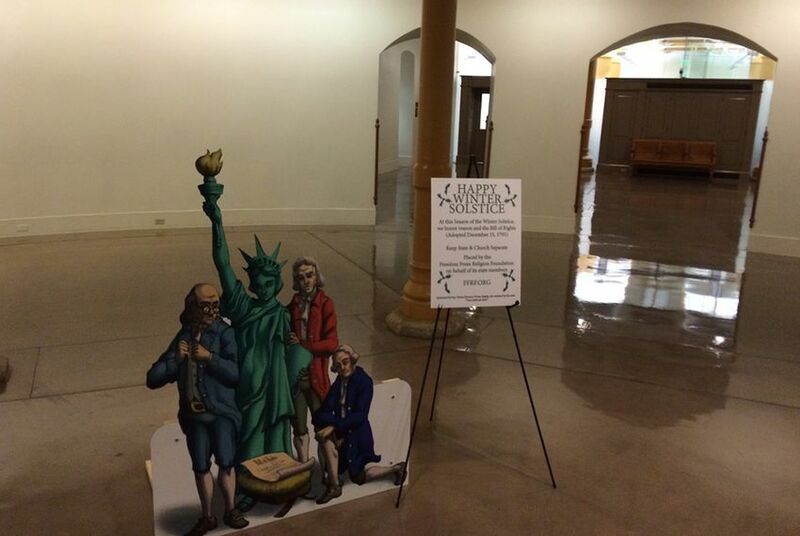 Greg Abbott violated a group's freedom of speech by removing a mock Nativity scene from the Texas Capitol two years ago. A federal judge ruled against Texas Gov. Greg Abbott's decision two years ago to remove a mock Nativity display that advocated the separation of church and state from the Texas Capitol. U.S. District Judge Sam Sparks ruled late Friday that Abbott "violated [the Freedom From Religion Foundation's] clearly established First Amendment right to be free from viewpoint discrimination in a limited public forum." It all started in late 2015 when the Freedom From Religion Foundation placed a "winter solstice" display in the Capitol basement. The exhibit featured a cardboard cutout of the nation's founding fathers and the Statue of Liberty looking down at the Bill of Rights in a manger. Abbott ordered its removal, calling it a "juvenile parody" and writing that the "Constitution does not require Texas to allow displays in its Capitol that violate general standards of decency and intentionally disrespect the beliefs and values of many of our fellow Texans." Abbott took the action in his role as the chairman of the State Preservation Board, the body tasked with preserving and maintaining the grounds of the Texas Capitol and several surrounding state landmarks. The board had previously approved the display. The governor could not immediately be reached to comment on the decision. FFRF posted the decision on its website. "We'd rather keep divisive religious — and irreligious — views out of state capitols," said FFRF co-President Annie Laurie Gaylor. "But if the government creates public forums, and permits Christian nativities in them, there must be room at the inn for the rest of us."